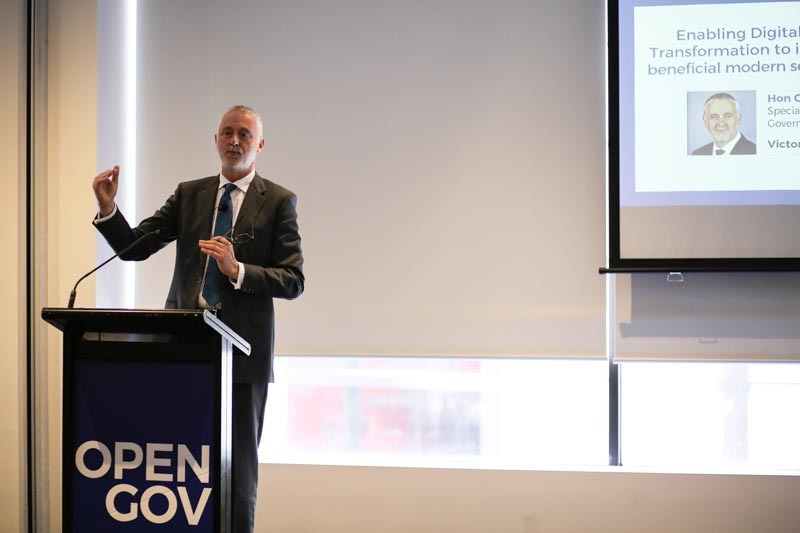 A diverse group of officers across the Victorian government gathered on 17 November 2016 at Rydges Melbourne for the Victoria OpenGov Leadership Forum. Mr. Mohit Sagar, Editor-in-chief at OpenGov and host for the Leadership Forum, kick started the event and invited Minister Hon. Gavin Jennings (above photo), Special Minister of State & Leader, Government in the Legislative Council, Victorian Government on stage for an opening speech. Hon. Jennings speech, titled “Enabling Digital Innovation and Transformation improve and deliver beneficial modern service to the citizens”, touched on a few major themes, which were providing better services for citizens and facilitating collaboration to create more opportunities. He spoke about getting systems right and improving government services as a whole so Victorian citizens can enjoy a more centralised and consistent service across different platforms. Collaboration between government agencies would inspire more confidence and encourage them to take more risks in the spirit of innovation.With over 6000 datasets in Victoria, Hon. Jennings mentioned that the government is looking at appropriate ways to open them up and make them more accessible. The ultimate aim is to increase data handling capabilities while maintaining appropriate privacy protection measures. He concluded that collaboration between people, institutions and enterprises in Victoria is the key to create more opportunities. Invited Victorian government speaker, Mr. Alex Jones (above), CIO, Department of Economic Development, Jobs, Transport & Resources (DEDJTR), spoke about how an agency can set itself up from a strategic perspective with his experience at the DEDJTR. Mr. Jones explained that DEDJTR is made up of 7 major business units and covers nearly 50 portfolio agencies- ICT strategy is about making the most of technology for the whole organisation. A case of study of breeding heat tolerant cattle was cited with the problem of heat stress reducing cattle fertility and production. The approach was to develop genomic breeding values for heat tolerance, by combining data from temperature and humidity records, milk production records and DNA markers genotypes from bulls and cows. Genomic breeding values allow farmers to select bulls and cows more tolerant to heat stress and accelerate breeding dairy cattle adapted to future climates. Mr. Jones emphasised that there is no such thing as an IT project, just projects which include technology implementation. The primary constraint is the capability and capacity of the owners: funding, approvals, design, implementation and operation. He also spoke about how cloud systems enable business units to operate more independently, but creates silos. Specialised systems must be owned by people who know how to use them but many business owners are unprepared for the responsibilities of ownership. In summary, Mr. Jones suggested organisations to take time to tackle legacy systems instead of rushing through the process during a merger of de-merger. Legacy IT is an unattractive investment which worsens with time and the critical role of the central IT function is to enable the organisation to deploy and manage technology appropriately. The ultimate aim of the GDS is to make digital service so good that people prefer to use them. Following multiple interactive roundtable discussions around public sector efficiency, building a culture of innovation, embracing digital disruption and emerging technologies like Blockchain, the post-lunch session saw a series of panel discussions, with enthusiastic participation from the audience. The first panel focused on digitalisation of services, which returned to the theme of beginning with the citizen or end user in mind when it comes to digital government services. Mr. William Confalonieri (above photo, with microphone), CDO, Deakin University, felt that the digital platform is the easy part and the difficult part is people. He also mentioned that it is important to think about future models and it is rather limited in scope to just think about current needs. Mr. Jithma Beneagama, Director, Digital Engagement, Department of Premier and Cabinet (Victoria) spoke about rethinking the service approach in the age of extreme personalisation and to provide individuals with services specific to their personality and preferences. It is about the synergy of services for the end user and not a random mix. Streamlining of and creating new services is also important and Mr. Foreshew-Cain spoke about his experience of the GDS – how a single domain is revolutionary idea for government with 4000 websites. Government has to challenge thinking in different ways – bring down the cost of failure, discover through trial and error to foster a positive development towards making things better. Subsequently, the next panel discussed issues around the use of big data analytics to solve problems facing government. The panel began with a question by Mr. Sagar on how to approach and start on data analytics for government – Jeremy Moon, Director, NSW Data Analytics Centre, Department of Finances, Services and Innovation said that to a large extent, problems of society are problems of government so that is one way to start. Mr. Klaus Fleche, Former Director of Analytics, Australian Immigration Border Protection ACT, explained that analytics is about ‘pushing’ the data to get actionable insights. Mr. Sagar also posed the question on how to get governments and relevant agencies to share their data, since many of them would want to hold on to it for their own use. Mr. Michael Cornelius, CIO, Department of Justice, Victoria responded by saying that it is essential to break the culture of holding on to data by fostering the culture to share data at the top level. Moving back on the topic on how to get the ball rolling on data analytics, Mr. Fleche shared from his personal experience that the key is to pick the right team of people to start the project together, understand the business context, data science and leading the process to the eventual end result. Mr. Moon reiterated that the starting point should the question of what are the problems that government are trying to solve and then look at the relevant data. Dr. Leong Mun Kew, Deputy Director, Institute of Systems Science, NUS commented that it came down to the maturity level of the team – once the maturity level is reached, then meaningful data analytic projects can be carried out. Mr. Fleche concluded that data analytics is about seeing new opportunities and values. The last two panels covered topics on driving change in government with cultural and gender diversity and managing cyberthreats respectively. For the former panel, Dr. Dale Andrea, CIO, VicRoads, summed it up beautifully – governments need to address inclusiveness issues and not merely talk about technology. On managing cyberthreats, the panel agreed that governments should understand the critical issues and know what to protect because they simply does not have the resources to cover everything. Mr. Scott Ayers, Director Service Operations, CenITex spoke about the example of ‘cyber-gyms’, to simulate realistic situations of a security breach, so that governments are prepared to deal with them in the event of a real incident. Mr. Andrew Saunders (above), Health Chief Information Services, Department of Health and Human Services, gave a presentation on the roadmap to the Health 2040 Vision in Victoria. The priorities are to enable a person-centred and well-being approach as current systems are focused on episodic care rather than regular and holistic care. Some of the challenges of towards moving to the new approach include existing paper records that cannot be digitally shared and the need to evolve from existing legacy building and ICT infrastructure. In addition, the current funding approach only supports discrete episodic care delivery. Wrapping up, Mr. Saunders views technology as a catalyst for change – working towards shareable digital clinical health data, sensors that are able to seamlessly collect data, sub acute care independent of hospital setting and precision medicine leveraging genomics, clinical and population data.